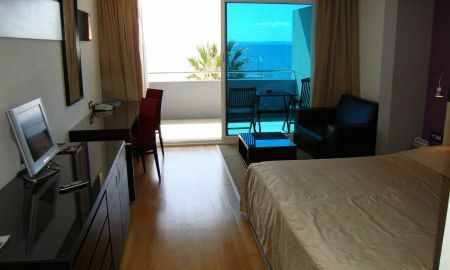 Charming room with direct sea view. 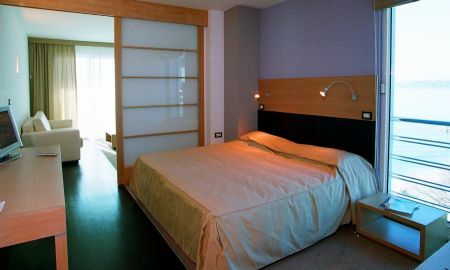 Charming suite with direct sea view. 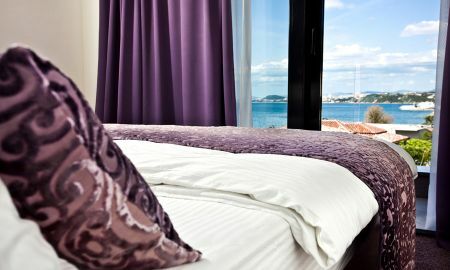 Located on a lovely beach with crystal clear waters, San Antonio is a modern hotel with breathtaking views to the surrounding islands, offering the ideal choice for people who want to enjoy serene and calm accommodation in Split area. The spacious and airy rooms feature a modern design with light shades, ample living corners, charming views, and all the facilities needed to enjoy a comfortable stay. The restaurant in San Antonio hotel is a chic space serving Dalmatian specialities and a variety of wines. For some pleasant moments, relax in the stylish lounge bar by the pool on the roof top of the hotel and sip your favourite drink while enjoying splendid views to the islands of Brac and Solta. San Antonio hotel also boasts a serene Spa situated on the top floor of the hotel where you can relax with indoor swimming pool, sauna and fitness room. Hotel San Antonio is located in Podstrana, directly on the beach, 8km from Split in direction of Dubrovnik.